That's quite the Tupperware Navy! Looks like a good time was had by all. RNA - It's in my blood. Weekly reports from around CT, the LIS and beyond. Thanks again for another fun, well-executed event, Alan! And thanks to all participants for not wussing out due to the forecast. WOW! Congratulations of that trophy pickerel Kira. Thanks Randy. 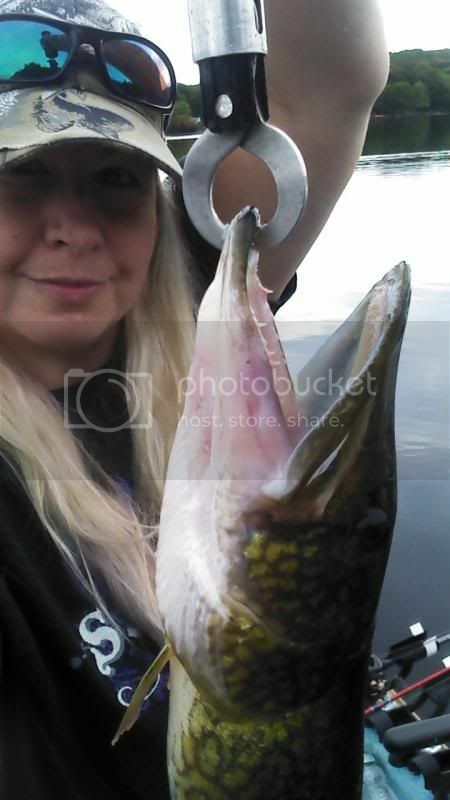 I didn't realize at the time that a trophy pickerel is only 5 lbs and 27". Probably the easiest trophy to get after channel cat (4lbs) and carp (20lbs). A very big thanks to Alan for setting this up! I have fished my share of tournies and this was probably the nicest, best run and most enjoyable ones that I have ever participated in! 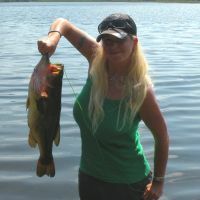 I caught all my fish (all that counted anyway...) on a black 1-ounce jig that day! I use twin trailers on it, a Paca Chunk underneath (for it's swimming action and then a regular chunk on top to bulk it up. I always spray the whole thing with Yum craw-flavored scent. 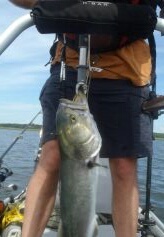 With that much rubber and scent,..I find that bass really hold onto it for quite a while! 1) Tossing it to the bottom and very gently wiggling it around the outside weedline which was 12-13 FOW on Rogers. I concentrated on places that had a dropoff around that kind of depth! 2) I also cast it out and burned it back, over shallow flats where there was just a foot or two between the surface and the weeds. This is tiring with a 1 ounce jig,..so I don't spend a lot of time doing it. I just give a few casts as I'm passing by those kind of areas,...but I did pick up two of my fish that way! Sounds like a great tournament, wish I could have attended.